Dictate of Kruphix has seen a little bit of play in block but standard does not quite have enough pieces to put together a competitive Turbo Fog deck at the moment. Its true home is with casual players. Who does not love a Howling Mine with flash? I think this will be a casual staple for years to come and at under a dollar the opportunity cost is minimal. Keep in mind that Journey into Nyx sales were cannibalized by Conspiracy. I like these as long term holds with the possibility of short term gains if they see adoption post rotation. Every competitive deck wants to run the best removal available to it. It is no wonder that Slaughter Pact is run in nearly every Modern deck with access to black mana. In the SCG Modern tournaments on both 7/25 and 7/27 the winning decks ran two copies of Slaughter Pact main deck. One of them even had another copy in the sideboard. Slaughter pact is used in several competitive and fringe modern decks including the Rock, Golgari Midrange, Melira Pod, Junk (Abzan,) Jund, Ad Nauseam and Amulet of Vigor. It is even used in Omnishow in Legacy. This card took a hit when it was reprinted in Modern Masters last year but it is on its way back. I think these are great pickups as they continue to recover. It is simply used in too many decks to not continue to increase over time. Aetherling has been the finisher of choice for control decks in every variation. We have seen Azorius, Esper, Bant and Jeskai (WUR) Control deck bide their time until this evasive and difficult creature was able to close out the game. Its time in standard is nearly at an end though. You really should have traded these away a long time ago. They are already near bulk and within a few months that is exactly what they will be. Aetherling has not seen any adoption in any other format. Get rid of them while you can. Brain Maggot is part of standard and block Golgari and Junk (Abzan) Constellation decks. This is a good indicator that the deck can be good enough to pick up steam at rotation. Unfortunately Back to Nature was reprinted in M15. This would seem to put a wrench in things. I have yet to see any copies of the hoser in any sideboards so this may not be a bad thing. This makes me cautiously optimistic for the deck. You could probably get these as toss-ins on a trade. You may recognize Demonic Tutor from pretty much every vintage deck that has any access to black mana. It is also used in every black commander deck by anyone that owns a copy. It is one of the most powerful tutors ever printed. It is also being reprinted as part of the Divine vs. Demonic Duel Deck later this year. It is not often that you see a negative spread on a vintage staple but you can buy them for as low as $17.89 and sell them for $18.91. There may be a price dip later this year after the Duel Decks are re-released. We still do not have a lot of information on them but I think this will be the high price for next couple years. This rare from Betrayers of Kamigawa is a little pricey at five mana. I’d rather run Ogre Battledriver in pretty much every case. It is cheaper and gives you an extra body. I do like that you can buy them for a little as $1.09 and sell them for up to $1.35. I see the price bump but I cannot find anything to attribute it to. It is a rare from Lorwyn and part of the powerful faeries tribe. I cannot find any results indicating even fringe modern play. Maybe someone is trying to make Waste Not work? If you have any buylists are now offering $1.50 for them so I say take the money and run. The new slivers have yet to have any impact in standard but they are always popular in casual games. Sliver Hivelord is a great new commander for slivers. There are only so many ways do deal with indestructible slivers and Crystalline Sliver makes it even tougher. If you are going all out on a sliver commander deck you will want the nicest version which is why the Friday Night Magic copy is the one that is growing the most. There are still some vendors selling them for as little as $3.49 and you can sell them for as much as $4.32. Terra Stomper is legal in standard thanks to the green planeswalker deck that is used to demonstrate the game newer players. This means old Zendikar copies of the uncounterable fattie are now getting some attention. It practically calls out for Monogreen Devotion to give it a try. The most interesting thing is that the M15 version of the Stomper is valued at $3.46. This is odd since the deck it comes in is free. It is also included in the M15 Deckbuilder’s Toolkit. It is scarce enough though that it is virtually a mythic rare. I would trade them while you can. You can even help out some new players by offering a replacement Terra Stomper along with other cards they need to build their collection for their M15 copies. There really is no competition for the biggest winner of the week. Early testing with Ensoul Artifact in Modern Affinity has been promising. Sure you can make your Darksteel Citadel an indestructible 5/5 but why stop there? How about Inkmoth Nexus? Either they have an answer or they are on a two turn clock. It would even dodge Creeping Corrosion or Supreme Verdict. Unlike Steel Overseer Ensoul Artifact does not force you into overextending. 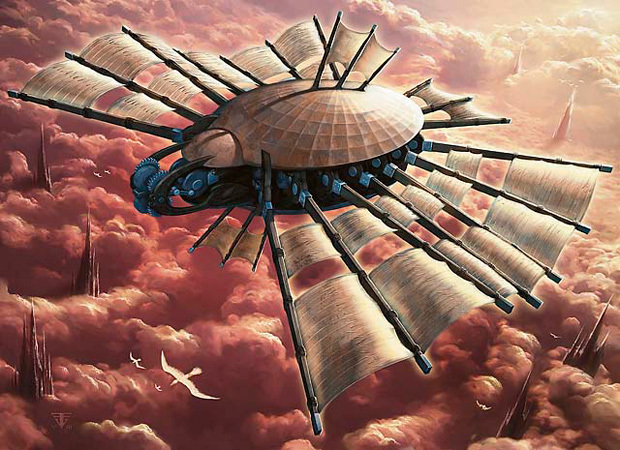 Vault Skirge and Ornithopter are also impressive with the aura. That does not even take into account flexibility to turn a creatureless battlefield into a slaughter when you enchant a Mox Opal or Springleaf Drum into a 5/5 with virtual haste after mass removal. It does not matter whether you think this is good enough or not. What is important is that other people do. These people play eternal formats and want the foils. Keep your eyes open. You will have a chance to trade some Standard playable cards into the hottest new thing in Modern. I just would not let them rot in my binder too long. This does not feel like a $1 card to me. It has not had the impact that Eidolon of the Great Revel had but it is still being used in multiple formats. Modern and standard are using it in Boros Burn and Red Deck Wins variants. Even Legacy Burn decks sometimes run it. If you are bullish on this card then I would sit on at least a play set. It is as low as it is going to get. If you are bearish on it you can still make a little money. You can buy these for as little as $0.35 and sell them for $0.75. Hokori, Dust Drinker is used in Modern GW Hatebears. It is also one of the most trollish commanders imaginable. It is a Rising Waters on legs. I expect we will see more Hatebears with the recent printing of Hushwing Gryff. Hokori is a pretty safe pick up. You can get him for as little as $0.99 and sell him for $1.07. Standard Boros Burn, Boros Midrange and Naya Aggro all want Forges to help fix their mana. We now have confirmation Khans will include wedges so I expect these will also see play in Mardu (RWB) and Jeskai (WUR) decks. However the multiple printings of the painlands and the amount flooding the market from M15 will drive all of their prices down. I would move these quickly. I really enjoy the flavor of this card. It is a double sided legendary equipment that turns into a 13/13 demon. It is not going to be reprinted any time soon if ever. It has a lot of casual appeal but outside of commander it is pretty unrealistic. I like it as a long term spec just due to sheer novelty but realistically your Magic dollars are probably better served elsewhere. Burn has been getting a lot of attention in Modern recently. You have Kitchen Finks, Spike Feeders and Daybreak Coronets pushing players out of burn range. That is part of why Flames of the Blood Hand is essential in those matchups. It keeps the game plan progressing while shutting off escape routes. Monored Burn, Boros Burn and even Rakdos Burn have been appearing in Top 8s and Top 16s. I would look at this as a fire sale (pun intended) on Flames of the Bloodhand and pick some up. Ensoul artifact on Inkmoth Nexus is not quite a two turn clock – the aura would fall off at the end of turn, once Inkmoth Nexus stops being a creature. You are quite right! I guess that would have been a little too good. I guess you have to settle for an alpha strike with Cranial plating and try to one hit kill them. Somebody answer the phone, because I called it on Ensoul Artifact getting attention.